Congrats on your sale, Marilyn! Wow, very beautiful work !!! 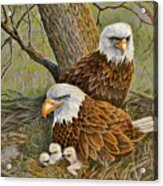 Thank you to the buyer in Elmwood Park, IL for purchasing a framed print! Thank you, Phyllis, for the feature in Footprints of Audubon Group! Many thanks for the feature in "Created by my Pencil Power" group, David! 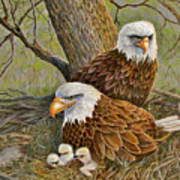 So pleased that someone in Mahtomedi, MN liked my eagle family and made a purchase today. Thank you! Thank you for the lovely compliment and votes, Geoff. That is so kind of you, Ruth. Thank you. Doug, your wonderful comments and votes are so appreciated! Thank you so much. Thank you so much, Hazel, for your kind comments and votes for support! I appreciate your visits Donna!! Sorry I missed your post Anne! Thank you so much. Thank you so much Barbara! I understand this pair is getting ready to be parents again! It is very hard to imagine that this nest is right in the middle of a housing area in SE Decorah. Bald eagles are no longer rare in this part of Iowa with a number of active nests in the area along the Upper Iowa, Cedar and the Wapsipinicon Rivers. This pair is very prolific which makes them that much more interesting to watch. Mary, thank you so much for the additional information about the eagles. They are so regal and fascinating to watch on the webcam. Missed your comment somehow, Meryl! Thank you for stopping! I want to thank you so much for your continued support, John. WFS would be lost without you! After watching the famous Decorah, IA bald eagle's webcam on the internet during their entire nesting process and the hatching of three chicks, I decided I had to do a colored pencil drawing of the entire family. Their nests are usually high in a tree above a water source for the fish that they prefer in their diet. I wanted to include their food items in the drawing, a rabbit and a fish, but tried to keep them subtle. 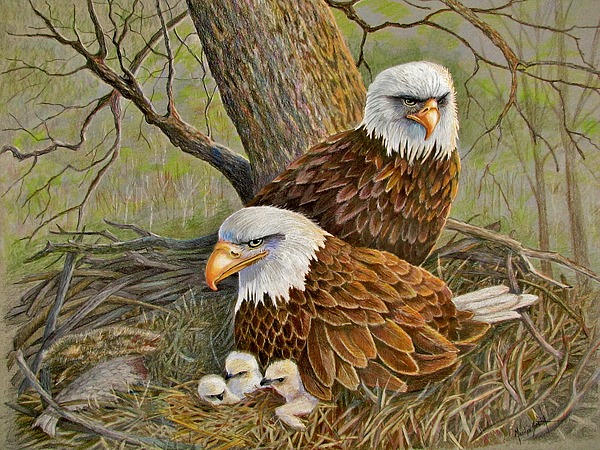 This pair of eagles return to the same nest year after year but always remodel and add new branches and twigs for the upcoming season. Their nests are generally 5 or 6 feet in diameter and can weigh as much as a ton. Males and females look similar with their distinct white heads, however the female is usually slightly larger. The juveniles do not get their adult plumage for several years.